The diaper is taped snugly around an 8" diameter round container. The container has a 1/8" opening in the bottom. The bottom of the container is also concave, so that the opening does not rest directly on the padding surface. This allows liquid to flow freely onto the padding. Time from step 4 to step 5 is recorded. This is the "Time to leak". Combined with the capacity, this provides an idea how quickly the diaper can absorb wetness. 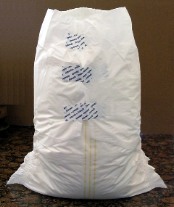 The diaper is allowed to "rest" for 5 minutes. At this point the distance the wetness has spread from front to back is measured. This is the "Distribution". This indicates how well the diaper is able to spread wetness and make the most use of available padding. The diaper is then placed face-down on a solid surface. A 8x12" plate is pressed into the center of the diaper with a force of 150lbs for 10 seconds. The amount of liquid released is measured. The diaper is taped back on the test container and steps 3, 5, 6 and 8 are repeated. This gives the "Rewet capacity" and press-out.